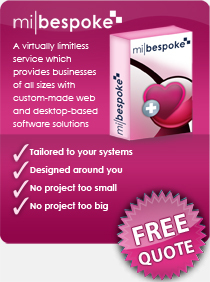 Because every one of our clients is unique, we are often asked to develop bespoke solutions. Website Design: For the Montpellier Interactive team, this provides the opportunity to deliver inspirational, web-optimised websites and softare applications, and in delivering challenging projects, we're always pushing the envelope to keep you at the pinnacle of web technology. limitless: Whatever your requirements are, we have the technical expertise to turn your vision into reality, from social network communities and scientific risk-based calculators through to virtual learning environments and automated SMS-based marketing. integration: We have the ability to work with your existing IT systems, bringing them up to speed with the latest technology, but we are just as happy to tackle new projects from the ground up – whatever it takes for clients and their business to reach their goals. Our team are also experts in IT hardware, making your systems work harder and smarter. simple: Your technical ability is not an issue. Working closely with our clients we get a deep understanding of what is required. We then develop a technical specification document from which we can start to work on your solution. But don’t just take our word for it. Check out our case studies and see for yourself some of the amazing work our team has done.